Unitronics’ newly-released UniStream® 5" is a multi-function programmable logic controller in a superbly compact hardware profile: PLC+HMI+I/O built into a single unit. All-in-One, compact PLC+HMI with built-in I/Os fills a niche in the programmable controller market—serving OEMs and system integrator who need space-saving controllers that deliver the functionality to control complex machines, while creating a competitive advantage via a color-touch HMI panel. This All-in-One controller is available in two series: UniStream 5" and UniStream 5" Pro. Both series support SNMP, VNC, FTP, SMS, email, and communications via GSM/GPRS modem. The Pro version also offers a built-in Webserver, audio jack, and video support, as well as SQL, a plus for system integrators and OEMs facing Industry 4.0. UniStream 5", with its resistive color touch-screen reduces space and wiring requirements, and eliminates the need to set up Panel-PLC communication. Built-in I/O configurations vary according to model, offering digital, analog, high-speed and temperature I/Os. Users can expand the configuration up to 2,048 I/O points. 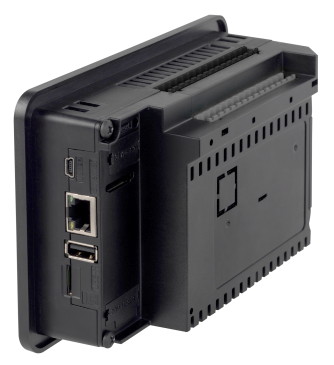 Built-in COM ports include Ethernet, 1 USB host and 1 Mini-B USB device ports; additional add-on ports for serial and CANbus are available. Unitronics distributor, MSI Tec, was put to the task of designing a control panel for the natural gas engines at the City of Tucson's well pumps. The control panels would need to be installed at 43 sites around the city. The cost per engine and shaft can be greater than $400,000. Rapid changes in RPM can cause a large column of water to shift up and down quickly and become a very expensive jackhammer, so a robust and reliable controller for these control panels was a necessity. How can brewers achieve impeccable product consistency? Implementing automation and industrial control can help small brewers produce consistent, high-quality beer with the reliability of their big-name competitors. Unitronics all-in-one PLC+HMI controllers offer a user-friendly, cost-effective solution with all of the key capabilities that brewers need to achieve impeccable results. For more information send an inquiry directly to Unitronics Inc.